This week, after a report on NJN public television, Christie acknowledged that he had failed to properly disclose lending a subordinate in the U.S. Attorney's Office $46,000. He admitted not paying taxes on the interest he received, and said he would correct his tax returns and financial-disclosure filings. Christie's replacement in the office, Ralph Marra, is under investigation, according to the Associated Press, to determine whether he made inappropriate public comments in support of Christie's campaign. And this month, it was disclosed that Christie had spoken to Karl Rove, a top strategist under President George W. Bush, about a possible run for governor. Democrats immediately accused Christie of violating the Hatch Act, which bars federal employees, including U.S. attorneys, from engaging in political activities. Chrisitie's involvement in these incidents has now been know for over 20 days, but he still maintains a significant lead in the polls. New Jerseyans tend to shift toward the Democratic candidate as the election approaches, so this race may still tighten; but for the moment Christie appears to have dodged a crucial issue. On another New Jersey front, Independent candidate Chris Daggett released his first TV ad on Monday highlighting his ability to solve problems. 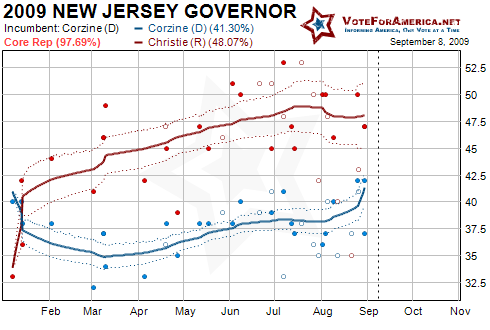 When Daggett is included in the poll, the spread between Corzine and Christie is significantly less. McDonnell's thesis obviously takes a position against working women, which will likely hurt him among, well, working women. The ramifications of McDonnell's thesis have not yet been acknowledged in the form of a public poll. A poll detailing the aftermath of the Post's reporting has simply not been commissioned. Although the SurveyUSA poll was taken during Sept 1-3, I don't think the story had become widely understood during this time period. 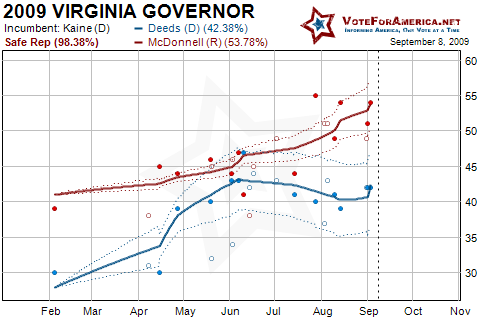 McDonnell continues to hold a substantial lead, and his Democratic opponent Creigh Deeds will no doubt focus on the thesis. McDonnell has since released a TV ad in response to the thesis issue; the ad basically contains political unicorns and rainbows. If McDonnell can get past his thesis, much like Chrisite overcame his unreported loan, the election is still easily within his grasp. Obama will speak to Congress tomorrow at 8 PM ET on the subject of Health Care Reform; I would encourage everybody to watch his speech.